This page is really just a bit of fun and a little writing exercise I make no claims to the quality of. 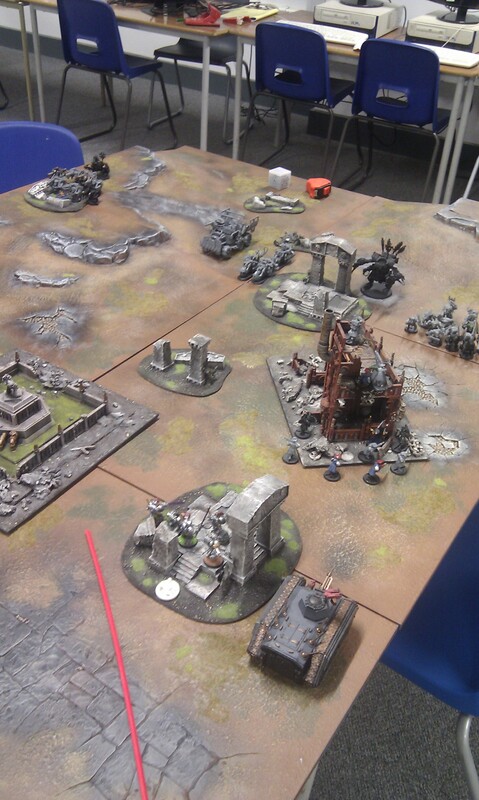 I wrote a while back about how it’s a lot harder than it seems to write within someone else’s setting but nevertheless I had a little go in the name of supporting my local wargaming club, Southend Toy Soldiers Club (found online here). 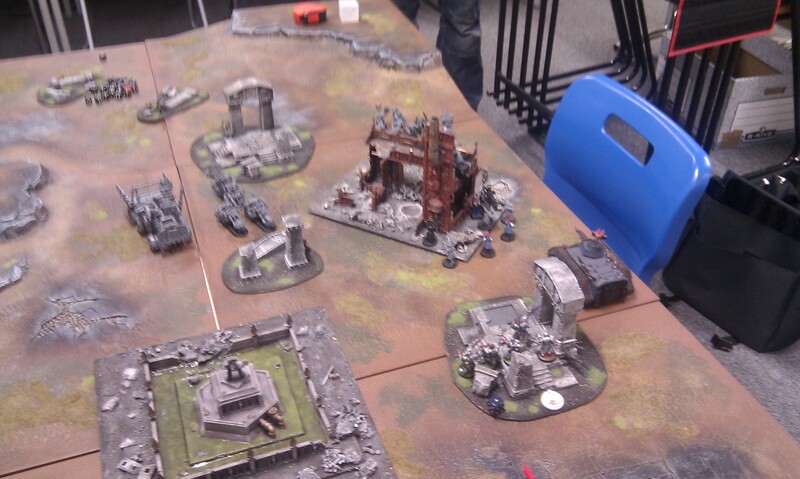 So, without further ado, an account of a quick game of Warhammer 40,000 played at my local gaming club. With photographs. I am sure eagle-eyed fans of the game will spot a dozen errors in technical matters, or things that aren’t quite right, but I don’t think that’s a big issue really. The convoy had come to a crunching halt when Gazkit’s truck had hit a mine. At first he hadn’t noticed it over Biggit’s terrible driving, the stupid git made every gear change feel like the whole vehicle was shaking itself apart, but this time the crash had been accompanied by half of Biggit landing on Gazkit’s head. Gazkit wasn’t the smartest ork going but he figured that if his driver was in the back with him he probably wasn’t driving and so the vehicle had probably crashed. The sudden halt had given Morkengan, the convoy’s accompanying dreadnought, time to catch up. The red-and-black machine was waddling along the perimeter surrounded by a bunch of Gazkit’s best troops, keeping a beady eye out for any humans that might be challenging them. “It’s done.” The ork, whose name Gazkit had forgotten, pointed proudly at the truck. He had potential. The front end had been hastily rebuilt out of bits of an unfortunate ork’s bike and a mess of wheels and armour plates that looked suspiciously like old bin lids. And not a moment too soon, it seemed, because only a few seconds later a bellowing voice, distorted by the wind, shouted that the humans had been spotted at the other end of the valley. Inside the transport, rain was seeping through the long-blown seals on the top hatch and falling down the back of Inquisitor Donel’s neck. Each icy-cold drop caused her to pause momentarily from the day’s reading and shift position slightly, and after about the fourth or fifth time this happened she noticed one of the novices packed into the benchlike seats try to suppress laughter. “Book of Graces, Chapter 19, Verse 57 to Chapter 23, Verse 40. Now. Begin with the line that starts In Nomine…” Donel had had enough. Had enough of this rain-soaked planet, had enough of being confined in this reeking, jolting metal box, and most of all had enough with the fools that made up her bodyguard. The novice frantically leafed through her prayerbook as Donel advanced on her. “That will do. I care little for your glorious doors. Tonight you will do penance. Copy the Book of Graces in its entirety four times. Work on this during your rest-hours.” Donel’s communications unit suddenly chimed, and she opened the channel. The Chimera’s driver gunned the engines to close ground on the orks, visible mostly only as a cloud of smoke and dust from their vehicles. Gazkit had found a dead good spot on top of a big hill to shoot the oncoming humans, and put his biggest guns all around him. In the valley, the rest of his forces were milling about, waiting to see what the humans did. He would have had them charge in but he had enough brains to know that was a bad idea against these humans in the grey boxes. They were a bit cleverer than the flimsy ones the rest of his clan were beating up on the main front, ducking about and avoiding combat wherever possible, so Gazkit figured they were probably up to no good. His truck crashing where it did, and bringing him into combat with the clever humans, must have been fate. When his boys suddenly came under fire from humans much closer than he’d expected, he began to swear down the speaking-tube his attendant gretchling was carrying until something happened within his ranks. Donel saw the orks were holding their forces back, and eventually worked out why. There was a small unit of Guardsmen pinned down in a ruined farm building close to the ork lines – or, as a subsequent look suggested, actually trying bravely to ambush the orks. Ten of them, though, versus what must have been twenty or so greenskins was poor odds. Gunhed was boss of Gazkit’s Gunners, the luckiest orks in the whole convoy. They had been given the biggest guns with the most bullets of any ork, and a prime spot with a whole lot of humans to blast away at. When the fire order came, he pointed his gun at what looked like a gleaming blur on the horizon and fired until the clip ran dry. The other gunners followed suit, and when the smoke had cleared he wasn’t entirely sure what had happened but was certain he’d achieved something. There was movement, for sure, within the fallen statues and pillars. Gunhed wished he had one of those eye-glass things Gazkit had, because then he could have got a better look at what he was shooting at. Shooting was fun, but shooting at people you could see was better. At the bottom of the hill, the main mob was firing everything it had at the building that contained humans. Ork tactics weren’t sophisticated, but shooting the people closer to you – the ones who were shooting you – was a good idea. One mob, Buzza’s Boys, suddenly launched itself at the strongpoint, shouting war-cries and firing their pistols wildly. A hail of grenades and bullets forced them back. The humans had been expecting that. Buzza watched as Zammo, formerly the luckiest ork in the mob, took a grenade in the forehead and exploded spectacularly. Not much to do but shrug and try again. Justicar Josephus didn’t know that the xenos shooting him were Gazkit’s Gunners, or that they couldn’t even see him properly. All he knew was that a hail of bullets had fallen from the high ground and downed three of his brothers, and the first priority was to return fire. Unlike the orks, he could see their position clearly, and could see they were few in number but heavily armed. Tracer fire from his units’ boltguns, and from his comrades on the other side of the pass, was flickering around the xenos until eventually they began to drop – three of their brutish bodies were rent in half by fire from the Grey Knights’ heavy weapons, enough of a toll to check their fire for a moment. Josephus surveyed his squad; the fallen brothers had died instantly and little could be done except the last rites. He swore the orks would pay for such an insult. In the old tractor-shed, Captain Barquentine of the Kalmarian Light Rifles was ducked behind a wall and quite unable to see the exchange of fire between the space marines and the enemy machine gunners. His world currently comprised one run-down farm outbuilding and the few hundred metres of ground around it which had all of a sudden become filled with orks. He swore on the Emperor’s name that when he found the idiot who had stirred the hornet’s nest he would introduce them to his machine gun. A massive, unsteady wall of metal was looming in front of him, belching flames and bullets in every direction except through the ragged window-frames of the building. Seeing that the squad’s designated heavy weapon gunner was currently shaking with fear, Barquentine knew he had only one option if he was going to stop whatever that thing was. Crouched by him was a woman in what had once been a rain-soaked ballgown, clasping a skull-headed staff and wearing an elaborate crown. “Cassandra, you are needed.” Barquentine knew that no matter how bad things got, it never hurt to be polite to nobility. The woman did something impossible with her hands and suddenly everything seemed clear to Barquentine. He knew exactly where he would need to aim to bring the orkish machine down, and exactly how to tell Swelter, the trooper manning the lascannon. Swelter fired, and the ork dreadnought exploded. Cassandra had once again manifested her power, and saved his life. The psyker was a curious woman, but a useful one to have about, he reckoned. The sound of a Chimera’s engine was a surprise to Barquentine’s whole squad, compounded when it turned out to be painted in the colours of the Inquisition. It opened fire on the orks who had just tried to storm the building as they regrouped and wiped out almost half the crowd in a single burst. As they faltered, Barquentine watched their leader take his pistol and shoot one to bring them back into line, and smiled as he realised the language of an officer was universal across species. He heard the radio crackle into life and picked up the headset from around his neck. Gunhed had seen three of his boys shot down by the humans and was mad. Gazkit seemed to be doing nothing at all, and so he just carried on firing. He fired until the humans stopped shooting back, at which point he figured they were probably all dead. In the field of stones, Josephus was already dead. Gunhed’s first wild burst of fire had decapitated him. The rest of the orks’ fire had been at a pile of corpses. Down in the valley, the Speed Kings had finally stopped bickering enough to decide on what to charge. After seeing Buzza fail to take on the humans in the building, they had been looking for something softer to go for and a light tank seemed a great choice. Guns blazing, they sped towards the vehicle. Booster, the leader of the Speed Kings, began to realise things were going wrong when the tank seemed to be letting them close in without shooting. By the time it was too late to do anything, his small ork brain finally realised what was about to happen, and he swerved wildly to try and escape. He somehow made it out of the killing zone with only a single arm missing (and even that not the one with his precious power claw on it) but noticed the other bikes were now just wrecks. On the other side of the shed, Buzza had another go at charging the humans. Again he realised this was a bad idea as soon as they started shooting and settled instead for claiming the few yards he had managed to advance before getting shot at as a moral victory. Barquentine was laughing hysterically at the orks, who appeared to not have any fight in them at all. One of the deadliest enemies of humanity, turned away by ten men in a barn and a woman dressed more for a waltz than a war. Safe in the knowledge that the orks weren’t likely to trouble him for a while, he had Swelter take a potshot at their ramshackle truck that was loping across the valley floor, but the idiot missed. As if in competition, a stream of what looked like assault cannon fire ripped the truck’s wheels off and it collapsed in a smoking wreck, and Barquentine suddenly realised he wasn’t alone. The Chimera continued its leisurely progress across the valley, ork bullets pinging off its armour, and massed fire from within exploded the last of Booster’s Speed Kings. The immediate threat removed, its turreted multilaser took a few shots at the orks on the hill as if trying to get revenge for Josephus’ squad. Gunhed was even madder now. One of his boys had suggested they leg it, so he’d shot him. Now he was on his own with only the useless git Gazkit for company. Gazkit suddenly did something, to everyone’s surprise. He fired the arcane weapon he’d been lugging about at the squad of humans in the distance, fell over, and missed completely. That just about summed the whole day up for Gunhed. With their truck destroyed, Lugger’s mob had decided to do the most sensible thing possible and run towards the gits who had destroyed it. In their haste, one of the orks tried running through a nearby ornamental fountain and to Lugger’s horror turned rapidly into a sort of greenish icicle before shattering. Lugger could see his targets, armoured humans he had a dim knowledge of as being rather tough, and began firing wildly. Over by the shed, Buzza’s few remaining boys tried one final time to charge and as the smoke cleared, Buzza realised he’d made it through no-mans’ land. Not only that there was a dead human in front of him. As Buzza climbed through an open window, pistol ready, he was fully expecting to wreak glorious mayhem within. What actually happened was a scrawny looking human female wearing a dress staved his brain in with a psyker’s staff. With Barquentine reporting total victory over the orks in his sector, Donel began the cleanup operation. Squad Magdalena and her own retinue wiped out the ones foolishly trying to charge the space marines, while the Chimera’s array of guns did for the ones on the ridge. Victory that day had gone to the Emperor’s chosen, as well it should. 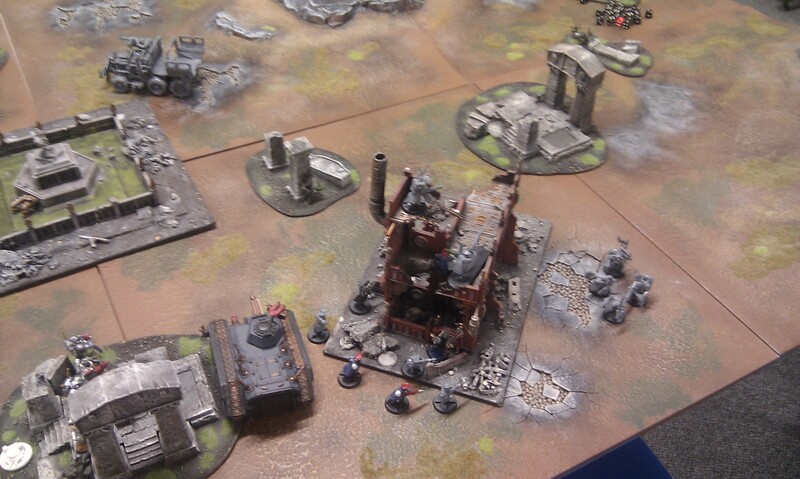 The loss of five Grey Knights was a harsh one, but fighting an ork ambush unsupported was hardly an inglorious end. And that Guardsman, Barquentine, had been something else. As she closed on his location, all became clear as her head pounded. He had had a psyker among his men. How had she not noticed before? As the Inquisitor regrouped with Barquentine and his men, nobody paid much attention to the sole ork fleeing the battlefield. Gazkit, on the other hand, didn’t stop running until he was safely back with the main body of his convoy. No more would he ride with the useless gits that called themselves a vanguard. He’d get himself a force field and find himself the biggest, baddest battlewagon to ride in, and show those humans what for next time. “Lady Inquisitor.” Barquentine saluted his superior. She was wearing all the sigils of a sanctioned psyker. Donel breathed a sigh of relief – to have had to purge these brave soldiers when they could have been better used within her retinue would have been a cruel waste of life. “You have all served the Imperium well.” Little more to say. On to the next battlefield. Donel still hated the rain-soaked, ork-infested planet.